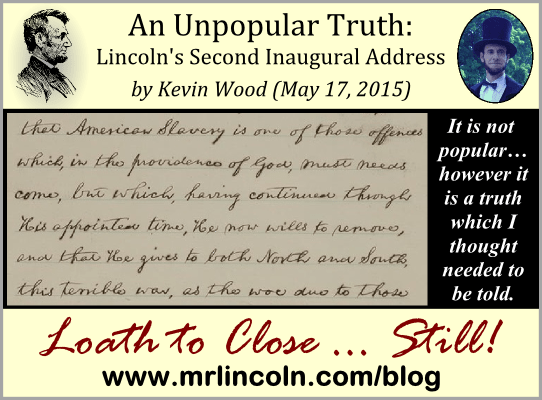 May 2015 – Loath to Close … Still! Abraham Lincoln’s Second Inaugural Address is likely his most well-known speech with the exception of his Gettysburg Address. Not surprisingly, these are the two speeches which are engraved in marble in the Lincoln Memorial in Washington, DC. Looking back on the past four years, Lincoln didn’t do the expected, i.e., defend his administration’s record. Instead, he offered a theological treatise on the reasons for the war. He first noted that the issue of slavery “was, somehow, the cause of the war” (another topic I have already addressed), and that neither side had expected such a long, difficult, and momentous struggle. He then observed that both sides “read the same Bible, and pray to the same God; and each invokes His aid against the other”. At this point he took his only swipe at the South – “It may seem strange that any men should dare to ask a just God’s assistance in wringing their bread from the sweat of other men’s faces” (a reference to Genesis 3:19) – but then he quickly added, “but let us judge not that we be not judged” (a quotation from Matthew 7:1). This was not the speech of a skeptic, nor a deist. Lincoln may have been either or both of those earlier in his life, but he was most certainly not at the end of his life. This was the speech of a man who accepted the Scriptures as truth, and who saw God as very much at work in the events and circumstances of the world and his own life. El segundo discurso inaugural de Abraham Lincoln es probablemente su discurso más conocido con la excepción de él de Gettysburg. No sorprende que estos son los dos discursos que están grabados en mármol en el monumento a Lincoln en Washington, DC. Mirando hacia atrás a los últimos cuatro años, Lincoln no hizo el esperado, es decir, defender el historial de su administración. En cambio, ofreció un tratado teológico sobre las razones de la guerra. En primer lugar notó que el asunto de la esclavitud “era, de alguna manera, la causa de la guerra” (otro tema que ya he abordado), y que ninguna de las partes había esperado una lucha tan larga, difícil y trascendental. Entonces observó que ambas partes “leen la misma Biblia, y oran al mismo Dios; y cada una invoca su ayuda contra la otra”. En este punto lanzó su único directo al Sur – “Puede parecer extraño que algunos hombres se atrevan a pedir ayuda de un Dios justo en escurrir su pan con el sudor de los rostros de otros hombres” (una referencia a Génesis 3:19) – pero luego añadió rápidamente, “pero no juzguemos para que no seamos juzgados” (una cita de Mateo 7:1). Este no fue el discurso de un escéptico, ni un deísta. Lincoln podía haber sido uno o ambos de éstos anteriormente en su vida, pero ciertamente no era al final de su vida. Este fue el discurso de un hombre que aceptó las Sagradas Escrituras como la verdad, y que vio a Dios como trabajando muchísimo en los sucesos y circunstancias del mundo y de su propia vida. The Baltimore Riots of April … 1861! It’s April and the people of Baltimore – some of them, that is – are rioting. No, I’m not talking about the recent riots, nor those of April 1968 following the assassination of Martin Luther King, Jr. I’m talking about the riots of April 1861! On April 18 of that year, Abraham Lincoln had been President for only a month and a half, and the nation was in complete turmoil. In just the last week, Fort Sumter had fallen to the rebels, Lincoln had called for 75,000 volunteer soldiers to defend federal property, and the all-important state of Virginia had voted to secede from the Union and join the original seven southern states in the Confederacy. The other southern states were threatening to secede as well, among them another very strategic one: Maryland. If Maryland had joined the Confederacy at that moment, it might have struck a fatal blow to the North. Washington, DC would have been cut off from the rest of the North, and would have easily fallen to the Confederates as it had no troops to defend itself. If the nation’s capital were controlled by the South, England and France would have been much more likely to recognize the South and come to her aid. The situation was dire and tense. All of Washington – southern sympathizers excluded – anxiously awaited the arrival of the first northern troops. Finally, on April 18, several hundred Pennsylvania volunteers reached Baltimore, only 40 miles away. Baltimore presented a complication, however, as it had separate train stations for the lines arriving from different directions, meaning that travelers needed to have their railcars pulled a mile by horses through the center of the city, or they had to cover that distance on foot or by stagecoach. In addition, Baltimore was a secessionist hotbed. In fact, two months earlier, these two factors had coalesced in a plot to assassinate Lincoln while he changed trains in Baltimore, which was only thwarted by disguising him and sneaking him through the city in the middle of the night. As the Pennsylvania troops proceeded from one train station to another, an angry mob of southern sympathizers confronted them, throwing bricks and stones and causing some serious injuries. The next day, a Massachusetts regiment arrived and was also confronted by a mob, this time armed with pistols and knives. The situation escalated, and four soldiers and a dozen civilians were killed, the first fatalities of the Civil War. The mob also looted and destroyed properties such as the office of a German pro-Union newspaper. How would the new President, still inexperienced and perhaps unprepared for the demands of the office, respond to the Baltimore riots? His response gives us a glimpse of something of the thought processes, temperament, and character which later would be recognized for what made him an effective leader. Lincoln summoned Maryland Governor Thomas Hicks and Baltimore Mayor George Brown to the White House to consult with them, and he also received another rather hostile delegation from Baltimore. He gave them the opportunity to air their grievances and to make their case that no more northern troops should be allowed to pass through not only Baltimore, but also no part of the entire state. Lincoln consulted with his Cabinet, which by his own design was split evenly between the two major groups which made up the still-new Republican Party. Although they would not be of one accord on this, nor many other issues, their frank discussion would allow Lincoln to consider the merits of conflicting points of view as he deliberated on the best course of action. When Governor Hicks called the state legislature to a special session a week later, General Benjamin Butler asked Lincoln to allow him to “bag [arrest] the whole nest of traitorous Maryland legislators”, who were expected to vote for secession. Lincoln chose instead to allow them to meet, and his gamble paid off when they adopted a neutral position in the conflict while overwhelmingly rejecting secession. The Baltimore riots were immediately memorialized in a poem by James Randall, “Maryland, My Maryland” – later to become the official state song –, which urges the people to “Avenge the patriotic gore that flecked the streets of Baltimore”, and which calls Lincoln a despot and tyrant. Lincoln didn’t allow these nor many other vituperative and inflammatory comments to influence him or his decisions. Over the next few years, Lincoln would make many controversial and heavy-handed decisions in order to keep Maryland in the Union, including suspending the writ of habeas corpus and imprisoning Mayor Brown and other pro-Confederate officials. But these were always done with the understanding that they were only warranted by the extraordinary conditions of civil rebellion, and he still opted for a softer approach whenever possible. Perhaps those responsible for responding to the recent Baltimore riots would do well to study Lincoln’s response in 1861, in hopes of preventing her streets from being ‘flecked’ even more. Posted on May 1, 2015 May 17, 2015 1 Comment on The Baltimore Riots of April … 1861! Aufruhr in Baltimore im April … 1861! Posted on May 1, 2015 September 30, 2017 Leave a comment on Aufruhr in Baltimore im April … 1861! Posted on May 1, 2015 May 17, 2015 Leave a comment on Les émeutes de Baltimore d’avril … 1861 ! Los disturbios de Baltimore de abril … ¡de 1861! Es abril y la gente de Baltimore – algunas personas, quiero decir – se están amotinando. No, no estoy hablando de los disturbios recientes, ni los de abril de 1968 después del asesinato de Martin Luther King, Jr. ¡Estoy hablando de los disturbios de abril de 1861! El 18 de abril de aquel año, Abraham Lincoln había sido presidente durante sólo un mes y medio, y la nación estaba completamente conmocionada. Durante sólo la última semana, Fort Sumter había caído a los rebeldes, Lincoln había solicitado 75.000 soldados voluntarios para defender la propiedad federal, y el sumamente importante estado de Virginia había votado a favor de separarse de la Unión y unirse a los siete originales estados del sur en la Confederación. Los otros estados del sur estaban amenazando a la secesión también, entre ellos otro muy estratégico: Maryland. Si Maryland se hubiera unido a la Confederación en ese momento, podría haber asestado un golpe fatal al Norte. Washington, DC habría sido separado del resto del Norte, y habría caído con facilidad a los confederados, ya que no tenía tropas para defenderse. Si la capital de la nación fuera controlada por el Sur, Inglaterra y Francia habría sido mucho más propensos a reconocer el Sur y acudir en su ayuda. La situación era grave y tensa. Todo Washington – simpatizantes del sur excluidos – esperaba ansiosamente la llegada de las primeras tropas del norte. Por fin, el 18 de abril, varios cientos de voluntarios de Pensilvania llegaron a Baltimore, a sólo 40 millas (65 kilómetros) de distancia. Baltimore presentó una complicación, sin embargo, ya que tenía distintas estaciones de tren para las líneas llegando de diferentes direcciones, lo que significaba que viajeros necesitaban tener sus vagones arrastrados una milla por caballos por el centro de la ciudad, o que tuvieron que cubrir esa distancia a pie o en diligencia (un coche tirado por caballos). Además, Baltimore era un hervidero secesionista. De hecho, dos meses antes, estos dos factores se habían fusionado en una conspiración para asesinar a Lincoln mientras cambió trenes en Baltimore, que sólo fue frustrado por disfrazarlo y llevarlo furtivamente a través de la ciudad en medio de la noche. Mientras las tropas de Pensilvania pasaron de una estación de tren a otra, una enfurecida turba de simpatizantes del Sur se enfrentó a ellos, lanzando ladrillos y piedras y provocando algunas lesiones graves. Al día siguiente, un regimiento de Massachusetts llegó y también fue confrontado por una turba, esta vez armada con pistolas y cuchillos. La situación se intensificó, y cuatro soldados y una docena de civiles perdieron la vida, las primeras víctimas mortales de la Guerra Civil. La turba también saqueó y destruyó propiedades como la oficina de un periódico alemán pro-Unión. ¿Cómo respondería el nuevo presidente, aún faltando experiencia y tal vez no preparado para las exigencias del cargo, a los disturbios de Baltimore? Su respuesta nos da un vistazo de algo de los procesos de pensamiento, del temperamento y del carácter, que más tarde serían reconocidos por lo que le hizo un líder eficaz. Lincoln citó al gobernador de Maryland Thomas Hicks y al alcalde de Baltimore George Brown a la Casa Blanca para consultarles, y también recibió otra delegación bastante hostil de Baltimore. Les dio la oportunidad de expresar sus quejas y de exponer su argumento de que no se debe permitir a más tropas del norte pasar no sólo a través de Baltimore, pero también de todo el estado. Lincoln consultó con su consejo de ministros, que por su propio diseño fue repartido en partes iguales entre los dos principales grupos que componían el todavía nuevo partido republicano. A pesar de que no serían unánimes en esto, ni en muchos otros asuntos, su debate franco permitiría a Lincoln a considerar los méritos de puntos de vista opuestos mientras reflexionaba sobre el mejor procedimiento. Cuando el gobernador Hicks citó a la legislatura estatal a una sesión extraordinaria una semana más tarde, el General Benjamín Butler pidió a Lincoln dejarle “cazar [detener] a todo el nido de legisladores traicioneros de Maryland”, quienes se esperaba iban a votar a favor de la secesión. En vez de eso, Lincoln eligió dejarles reunirse, y su apuesta compensó cuando adoptaron una posición neutral en el conflicto mientras rechazaron abrumadoramente la secesión. Los disturbios de Baltimore fueron inmortalizados de inmediato en un poema por James Randall, “Maryland, Mi Maryland” – luego se convertiría en la canción oficial del estado –, que insta a la gente a “vengar la sangre patriótica que salpicaba las calles de Baltimore”, y que llama a Lincoln un déspota y tirano. Lincoln no permitió que estos ni muchos otros comentarios vituperiosos e inflamatorias influyeran a él o a sus decisiones. En los próximos años, Lincoln tomaría muchas decisiones controvertidas y de mano dura para mantener Maryland en la Unión, entre ellas la suspensión del recurso de hábeas corpus y el encarcelamiento del alcalde Brown y otros gobernantes pro-confederados. Pero estas se realizaban siempre en el entendimiento de que sólo eran justificadas por las condiciones extraordinarias de rebelión civil, y todavía optaba por un enfoque más suave cuando fuera posible. Tal vez los responsables de responder a los recientes disturbios de Baltimore harían bien en estudiar la respuesta de Lincoln en 1861, con la esperanza de prevenir que sus calles sean ‘salpicadas’ aún más. Posted on May 1, 2015 May 17, 2015 Leave a comment on Los disturbios de Baltimore de abril … ¡de 1861!